hen the government unexpectedly ends the secret Genetically Enhanced Asset (GEA) program, Annarenee is uprooted from Dayton, the only home she’s ever known, and relocated to San Diego with all of the other GEA families. 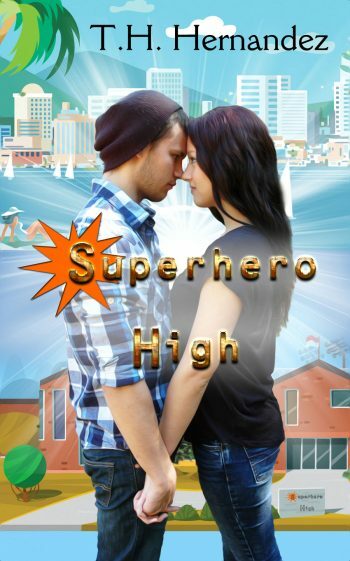 Queen of her public school, Annarenee is just another zero at Superhero High, a school without any sports teams.
. Follow Theresa Hernandez’s board Superhero High on Pinterest. This is a blog post I wrote in conjunction IAMALIVE, a suicide prevention hotline, for suicide prevention month about embracing your own superpower, whatever it is. Being socially awkward is normally associated with introverts; people who avoid social situations where their awkwardness is on full display. Being labelled weird usually makes people withdraw and avoid settings where their inability to function in socially acceptable ways can be scrutinized. It’s probably what I should have done, but I’m an extrovert by nature. I love being around people. I love talking to them, learning about them, and apparently embarrassing them by asking inappropriate questions or speaking too loudly. If I was more in tune with the subtle clues of those around me, I would have noticed what was happening and attempted to modify my behavior. But I was too busy just being in the moment to understand what others were subtly trying to communicate to me. As a teen, I cared far too much what other people thought of me, but I still didn’t get how I was impacting that view by my own graceless interactions. Instead, I was shunned by my best friends in middle school, making the last year of that painfully difficult time, all the more horrific. What made it even worse is that I never knew why. They never told me why I was suddenly persona non grata. To this day I still don’t’ know, but I have to assume it has everything to do with my oddness. While eighth grade was a nightmare, I made friends on the first day of high school. People I still count as friends today. These people found a way to embrace me the way I was. And even then, I don’t think I understood how my own ways of interacting with others factored into my relationships with them. I was social; had friends in a variety of groups – the party crowd, some jocks, a few brainiacs, and even other floaters like me. I can’t tell you there was an “ah-ha” moment when I realized I had my quirks. It was more of a slow dawning, like a lazy morning swaying in a hammock beside a lake. I was probably in my mid-twenties when I realized some of my friends would cringe or give me “the look” when I said something I probably shouldn’t have or said it MUCH too loudly. Once I made the connection, I decided to try to be more socially acceptable. To behave in a way that others expected. But I was uncomfortable; as if I was wearing a shirt that was too tight. Trying to be someone else wasn’t the answer. So what was? To be me. To be the best me I could. I stopped feeling guilty for being who I am and embraced my inner nerd. Sure, there are times I still say and do all the wrong things, but I’ve accepted that is a part of who I am. I do not shy away from other people. I interact with them in all my geeky glory. My superpower is destigmatizing being different. There is nothing wrong with marching to the beat of your own drum. Don’t ever let anyone tell you otherwise.